An unConference is a conference, but better. It doesn’t have a fixed agenda but rather develops on the spot. It brings together people from all sorts of different backgrounds and walks of life for a day full of new learning experiences. The idea behind an unConference is that every person has a special skill, something you can share with others. But often when we meet new people, we only talk about our job and never find out which great talents the other person has. During an unConference the attendees get to share those talents and learn from each other. 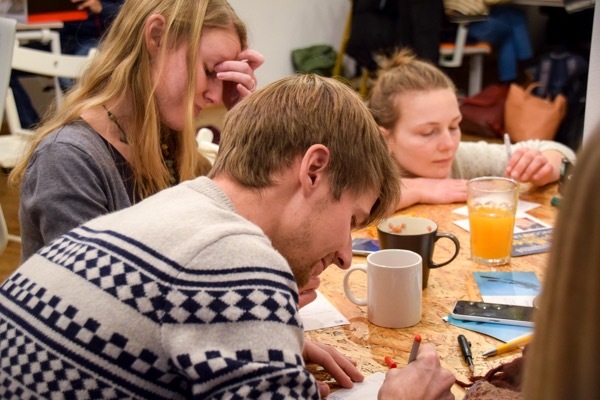 In the framework of the Black Forest Young Explorers Program, a team of creative and motivated Young Explorers decided to put up Freiburg’s first ever unConference. We didn’t know who would attend and what would happen during the event itself. Would there be enough people interested? Would somebody offer a workshop? Would people like those workshops? In the end, all of these concerns were forgotten. The group of 20 participants spontaneously came up with workshops as diverse as African Hip Hop Dance, sewing juggling balls, ballet, holding your breath for free diving, body percussion, a talk on long distance hiking, as well as an innovative card game. We had three different sessions with two or three workshops each and during the breaks everybody excitedly talked about their experiences. “I managed to increase holding my breath from 1:18min to 2:36min!” or “Look at my juggling ball, isn’t it cool?” were common phrases we heard while eating sandwiches and fruits. We forgot all concerns, and enjoyed the creative spirit and ideas and skills we shared! When the last workshop ended, everybody agreed: this was a unique and great experience, we need a second unConference soon. And so there will be! Stay tuned for Freiburg’s 2nd unConference happening in a bit!